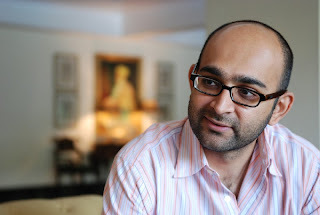 [A discussion with the Pakistani author Mohsin Hamid, whose new book The Reluctant Fundamentalist I wrote about in this post. Transcribing our conversation, I realised at what great length Hamid had spoken (nearly 6,000 words in a little over an hour, if you’re interested in such quantifiers). He gave elaborate, detailed answers to each question, which was creditable considering that he had been on the talking end of more than 30 interviews in the 4-5 days prior to our meeting. Book tours are stressful things even for that rare beast, the sociable writer. Hamid arrived for the interview directly after registering at the police station, something he had to do because of his Pakistani citizenship. It must be unnerving that the police station has to be your first stop at every city that you tour. It’s not very nice. On my first day in Delhi last week, I took along the photocopies I was told I’d require, but they said they needed passport photographs. Then I went to Bombay, where at the police station they said we don’t need photographs, we need photocopies. Then, when I got back to Delhi I had to re-register. So basically I’ve been in India for five days, I’ve made three visits to the police station and I’ve spent several hours doing this. It’s particularly incongruous because in the morning you’re giving haziri at the police station and in the evening you’re on the national TV network giving an interview. Obviously, I don’t hold this against Indians; I recognise it’s a bureaucratic thing. But it shows the absurdity and the completely backward nature of Indo-Pak relations. At the official, state-sponsored level, there’s this mutual suspicion: there’s a “you are a criminal until proved innocent” approach to one another. And yet, the people I’ve met privately have all been extremely friendly, engaged and interested. One encounters great generosity at the personal level. I think it’s no longer sufficient for us to say, “Oh, you know it’s funny that our countries behave in this way but we as people don’t.” By dissociating individual relations from the state policy, we are complicit in all this. Pakistanis and Indians should not require visas to visit each other in the first place. And if they do need visas, at the most there should be a 30-day stamp. There shouldn’t be any police registration. We all know that anyone who wants to sneak across the border and make mischief can do so, in either direction – they aren’t going to go and register at police stations. If I wanted to lose myself in Delhi, I could very easily do so. This isn’t an effective security measure. The Reluctant Fundamentalist takes the form of a dramatic monologue by a Pakistani, addressed to an American. In an essay you wrote that a novel can be a divided man’s conversation with himself. Is that what this book is? Yes, even though the very nature of the dramatic monologue indicates a bias. In this case, you only hear the Pakistani side – the American who is being addressed never gets to speak – and so the novel makes very obvious its biased nature. But in me internally, that other party, the American side, was speaking very much, and I was thinking about his responses. Unlike your protagonist Changez, who gets increasingly paranoid and defensive about his identity as a Muslim man living in the US, you’re comfortable with your two sides? More comfortable than Changez, yes, but not entirely comfortable. Even for those of us who have never left our homelands, the forces of globalisation ensure that we’re at least slightly uncomfortable with ourselves, slightly divided. But for many of us it’s still manageable. With the people who get very strongly affected, it depends on the extent to which international circumstances and politics act upon them. Those actions can be more or less strong. For someone in Iraq or in Palestine, they can be incredibly strong. For a Muslim man in New York, they are moderately strong. For someone chilling out in Club Med they are probably weak. Every human being has a series of cracks or fissures inside, and these moderate to strong external forces combine with the particular nature of fissures inside an individual. I had a greater feeling of security than Changez has, I was older and had been in America longer. What happens to him is not what happened to me. So yes, I am much more comfortable than Changez. But this doesn’t mean I have no fissures inside me. I’d like to say something here about autobiographical elements in my work, which is something I often get asked about. In my fiction I tend to write what I know about, which means that everything I write can appear autobiographical. Did I know people who grew up smoking charas and hanging out at rave parties and who became addicted to heroin? [An allusion to his first book, Moth Smoke] Yes. Have I been to Princeton? Yes. Have I worked in corporate New York? Yes. But am I these characters? No. You’ve been living in London for years now [Hamid moved there from New York in July 2001, just two months before the 9/11 attacks] and you’ve referred to that city as being a geographical and cultural midpoint between NY and Lahore, America and Pakistan. Does living there – and therefore being at a remove from both Pakistan and the US – make you more comfortable about your divided selves? London was a good place to go to, to become comfortable. As a person now I’m quite comfortable with my politics, with my relationship with both Pakistan and America. But now I have to look at London from a different standpoint: “Is this the place I want to call home?” And I really don’t know. When I go to New York I feel a strong passion for the city. When I go to Lahore I feel a similar strong passion. But I feel only a platonic affection for London. Which is safer than passion, and usually more durable. Yes, it is – I think the best relationships are often built on that foundation. But I don’t know if I might turn out to be a passion-junkie (laughs) who needs to settle down in a place that makes him feel much more extreme. London has one big disadvantage, which is its price. In being so expensive it drives career and economic decisions in a way that many other cities don’t do. Cabs are ridiculously expensive; even in New York they are half the price. You can have a meal in NY for half the price. And what that means is that while NY becomes a collective living room for its inhabitants, in London you can’t eat out as often – so your living room becomes your living room. And as a result people are more reluctant to engage socially. In Lahore or Delhi your living room is much bigger, and you probably have someone to clean it up. In London if you’ve invited six people home, to your tiny little flat, you have to think twice about whether to call a seventh or eighth person. One tends not to mix as much. Since you’re talking about social interactivity, a related question: How do you divide your time between your writing and your decidedly un-writerly job as a consultant? I work three days a week – the rest of my time I spend writing. Consultancy is my primary source of income – you need to pay the rent if you’re writing a novel! In India, there has been a recent trend of books written by people who have full-time jobs that are unconnected to writing. But these authors tend not to receive great critical praise. Instead mass-market-friendly epithets such as lad-lit are used to describe their work. You, on the other hand, are an example of a working professional who has won acclaim and been categorized as a literary writer. Well, I wouldn’t characterize that as a part-time/full-time or a working/non-working distinction. I mean, even Kafka had a job. About the writers who have full-time jobs and are not taken very seriously as writers: my question would be, “Do they want to be taken seriously?” I mean, much of the writing in the world has the good sense not to try to be literary – because “literary” at the end of the day is defined as books that sell very little! No one cares whether Harry Potter is literary or not; he reaches more readers than all of south Asian writing put together ever has. The other thing is that there is something about the desire to get literary acclaim that has to do with the glory of writing, separate from the economics of writing. And it may be that people who have no other source of income are trying more desperately to achieve that glory, because they are worse off. The third thing is that literary novels require a certain kind of mindset – a thought process, a psychological make-up which tends to fit very poorly with the work-world. And the reason for this is that the mind best suited for the construction of very large and complex internal universes (which is how the literary novel is constructed), such a mind tends not to be particularly gregarious. Such a mind also tends not to be suited to the typical 9-to-6 routine. Well, yes, it’s unsuited to the routine, but it is also unsuited to the level of social interaction. Many very talented writers are socially incompetent. And even if they are competent enough to deal with the regularity of the 9 to 6 job – or, as it’s now become worldwide, the 9 to 9 job – there’s another problem. The very process of drafting, revising, questioning everything that you’re presented with, which is what the literary writer does, means that when you step into a standard working environment, you recognise it as a ridiculous, arbitrary environment. Exactly. And you say to yourself, “I don’t want to do this, it’s ridiculous.” You reject it as being just a pawn in the system. But it's obvious that you understand the workings of such a mind, and yet you’ve managed to continue operating in a standard working environment. How do you achieve this balance, which is so difficult for the “serious writer”? I still think of writing full-time, and I might well do that in the near future, particularly now that this novel is a bestseller. But the financial viability of full-time writing isn’t the only aspect I have to consider. There are other implications. To be honest I’m a little frightened by the idea of living my life in my room by myself, just writing. Which is why I say, thank God I’m married! I’ll tell you honestly, I could never dream of being a full-time writer and not being married. At the end of the day the fact that I have my time with my wife, we have dinner together, hang out, travel together...these things keep me grounded, keep me socially interactive. Similarly, I think families can do that...having your parents and families around, your social network in place. The full-time writer who lives where his social network is, is much more likely to be at ease than, say, the diasporic writer. It would be much easier for me to be a full-time writer in Lahore than in London. I was struck by the playfulness of the writing in The Reluctant Fundamentalist. Little things like the names – Erica/America, Underwood Samson/US and Changez (who “changes” over the course of the story). Then there’s the partly deferential, partly sardonic tone, which gives the dramatic monologue such an edge. Were these choices made to inject a lightness of tone, to offset the seriousness of the big issues that the book deals with? I think the effort to achieve lightness, to balance out the heaviness or darkness of the subject matter, is essential for writers. At a physical level it helps produce a book that doesn’t weigh very much – this one was chiseled down until it was as short as it could be [The Reluctant Fundamentalist is under 180 pages long]. The idea is not to remove the complexity of ideas but to reduce the weight of the reading process. I’m glad you say that it’s playful, because so few people tend to say that. People often get literalist about these things. They ask me, “Could Changez really have spent 3-4 hours talking to this American tourist in Anarkali Bazaar, with the other guy just sitting there and listening?” and the answer is NO, of course he couldn’t have! Basically what’s happening here is that you’ve walked into a darkened theatre and there’s one actor on the stage taking you through the play. I’ve often been told that Moth Smoke was a gritty, realistic story about a drug dealer, but what people tend to forget is that the frame of the book involves zipping into the Mughal Era – you’re in this strange courtroom where you’re the judge and all these characters start testifying to you. It’s a theatrical setting, which is what I’ve reached for in the new book as well. And the idea that both of those gritty narratives exist in a frame that is formally playful is very important to me. Because the idea of art as artifice, and art as frame, and art as something not real, is very important. I’m not among those writers who have magical realistic sympathies. For me personally – not for other writers but for me personally – it’s a rather dull exercise. What interests me is realism. But how do you deliver realism is the question. And I think we often deliver realism in playful ways. The way in which a film is encountered is quite interesting in that sense. You walk into a dark room with your popcorn, the credits roll, the movie begins...there’s this whole process of entering that experience. Similarly, in a book, which is a packaged good, why can you not have an intermediary who allows you as a reader to move from your own world into the world of the narrative, and to discuss that movement. In my book I hope this has the effect of positioning the reader’s mind slightly differently – rather than my telling the reader “you are encountering my wisdom”, it makes us joint players in a game. This brings me to the inevitable question about the writers whose styles you were influenced by as a young reader. You mentioned that you were never into magic realism. I think magic realism can be beautiful – it had its moment, Midnight’s Children was a great book, Love in the Time of Cholera was a fantastic book – but I’m just not sure where you go with it. In my writing I suppose there’s an element of magic realism too – but the realism is in the story while the magic is in the narrator’s relationship with the reader. I’m not sure how magic in the narrative can be used to advance things. Maybe some writers are doing it, I don’t know. The modernist experiments I’ve personally been influenced by include Borges’ short fiction, or by how Italo Calvino – or Nabokov in Pale Fire for that matter – deliberately makes the relationship between reader and reading central to the book. Camus’ The Fall. Then there’s the American tradition which I love because it’s so crafted from knowledge. Take Fitzgerald in The Great Gatsby, or Hemingway – these guys knew what they were talking about, they were intimately familiar with their subjects. I was talking about the chiseling process earlier, and I liked the way both of these guys chiseled their books – Hemingway, of course, is a master of taking things away. Then there are the African-American novelists – James Baldwin, Toni Morrison – which are important to me because here is the response of a “suspect class”, under suspicion for being of a particular group vis-à-vis the American system of power. And as a Muslim writer today how can you not refer to that? I don’t have many favourites in contemporary British writing, though I love Ishiguro’s work: the precision of the prose, the way his voice creates a character in Remains of the Day, the slow realisation of the reader about what is going on. More recently Never Let Me Go – I don’t think it got the attention it should have received, it’s a masterpiece, a slightly tangential view of our world, which illuminates a great deal about us. I love Manto, as well as some of the ideas in Sufi poetry. But among the current lot I’d place Haruki Murakami over anyone from south Asia – for his deeply fractured characters, his ability to take you through a series of incredible, absurd situations in a way that never lets you go. It occurred to me that Erica in The Reluctant Fundamentalist – a woman who’s pining away for a dead boyfriend, living in the past rather than the present – is similar to Naoko in Murakami’s Norwegian Wood. Yes. And it’s a peculiarly Asian thing – our traditional conception of love as this all-consuming thing, where the first love is everything and you would happily die for it. Love as mental illness. Even the notion of Sati, for example stems from it – I’m not getting into the politics of it here, but the idea that there is something wonderful about such love. And what I did in my book was to embody that in an American woman – someone living in a society that would normally laugh at such an idea, or send you off for therapy or something. You’ve often expressed your dissatisfaction with the widespread international perception of Pakistan as a hidebound, conservative society. For many of us who read Moth Smoke years ago, the effect it had was to reveal a hitherto unseen side of the country – the rave parties, the cosmopolitan elements of the major cities. Why do we not hear more such voices coming out of Pakistan? Well, from my generation we have Kamila Shamsie and Uzma Aslam Khan among others. The thing to remember is that neither India nor Pakistan has the sort of market for writing in English that can sustain an author’s livelihood. I’m told bestsellers here are defined as 10,000 copies sold. Let’s say such a book is priced at Rs 500 and the author gets a 10 per cent commission (sidelong glance at the Penguin Books representative, also in the room). That amounts to Rs 5 lakh for a book that may have taken five years to write – in other words, an income of Rs 1 lakh a year. And we’re talking here about the best-case scenarios – there might be only three or four authors who fit in this category. It’s fundamentally unviable, as you can see. And yet the reason why it has taken off is that India has produced superstar writers in the past two decades - with the emergence of Rushdie, Vikram Seth and later Arundhati Roy. And we’re seeing the results of that, which is a wonderful outpouring of literary fiction. Pakistan didn’t have that – we had Bapsi Sidhwa, Sara Suleri and a few others but no one who reached the level of international stardom that Rushdie or Seth did. So in many ways Pakistani writers of my generation have been the first stirrings of that. I’m not saying we are in the Rushdie-Seth league but we are at least getting noticed internationally, becoming bestsellers in some countries. The Indian experience has been an unusual one – an external success that has led to a domestic indigenous literary movement. Pakistan has lagged behind, but that’s set to change, I think. Recently a number of young writers have been in touch with me, emailing me, sending in their manuscripts. I think we will see a blossoming of Pakistani writing in the coming years. That’s encouraging, because writing has the potential to change the international perception of a country. Other things have the ability to change perceptions too. In pop music Pakistan is way ahead of India. There’s a reason for this: in India, because of the phenomenal success of Bollywood, Hindi film music has become the driver of economics. Pakistan, with a complete absence of a film industry of Bollywood’s standing, has developed a strong rock scene instead. And these bands are the superstars there, they get all the advertising money. I’m pleased to see that Pakistani rock bands are very popular here. 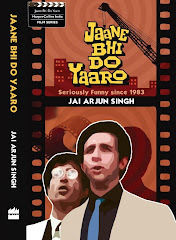 Bollywood is very popular in Pakistan and so are Indian writers. And some Pakistani writers have been published for the first time not in their country but by Indian publishing houses. This level of cultural interaction is great. What are your general impressions of present-day Indian Writing in English, or IWE as it’s called? I think there’s a bit of a lull in Indian writing in English, when one looks at the groundbreaking nature of Indian fiction that came before – whether it was the gritty social realism of Rohinton Mistry or the magical realism of Rushdie or the vastness of scope of Vikram Seth or the early whimsical beauty and later politicized polemic of Arundhati Roy – each of these is a major trailblazer. Of course, today there are fine writers like Suketu Mehta, Pankaj Mishra, Kiran Desai – I admire them all greatly. But on the whole it’s a less exciting time in terms of the quality. Maybe IWE is at a point where new techniques and subject matters are waiting to be discovered – so that we’ll see the second blossoming of IWE the way we’re seeing the first blossoming of Pakistani writing in English. But one shouldn’t be overly congratulatory about what’s happening right now. “Overly congratulatory” is a phrase you’ve used when discussing your discomfort with the chest-thumping aspect of Indian nationalism. What about that most disturbs you? The notion of jingoism is troubling to me. You see it in America today and you also associate it with France: the hyper-nation state kind of approach. It’s been happening in India too in recent years, and I don’t think it’s traditional to India. The official state policy of India used to have a humility associated with it. The abandonment of that for this “we are so great” and “India Shining” talk is a bit disturbing. There are a lot of good things happening here that you should be proud of – I feel proud of these things as a neighbour – but that shouldn’t blind us to the fact that more than half of the country doesn’t get enough food. That is “India Starving”, and these glib pronouncements overlook this. In Pakistan, on the other hand, there seems to be a perpetual cynicism about where the country is going. And this equally tends to mask the fact that Pakistan isn’t doing as badly as one might think. Malnourishment in Pakistan is less than in India, for instance. We should remain critical of the idea of the nation-state and of nationalism. These countries that we all show so much allegiance to don’t actually exist. When we get to the border there is no line on the ground, it’s something you can see only on the map. When we cross it we find that we have identical DNA, that we are biologically indistinguishable from the people on the other side. This idea of the nation-state is a reaction to a deep-rooted sense of personal insecurity in the face of an increasingly global and impersonal world. Human beings today have an exposure to levels of wealth far beyond their own, and this is particularly true of the middle class in developing countries. We turn on our TV sets and we see The Bold and the Beautiful. And while some of us can afford nice flats and cars, which is pretty damn good, it still doesn’t compare with the people on these TV shows. And we respond to these feelings of personal inadequacy with hyper-nationalism, by saying “Our group is great”. In India, we saw the hyperbole and its consequences recently in the cricket world cup – where the disproportionate and jingoistic build-up of what was essentially a mediocre team was followed by a ludicrous overreaction when they underperformed. Before the match against Bangladesh, the “we are great” stance went hand in hand with a sneering dismissal of the other team – a refusal to acknowledge how much they had improved in recent years. And as a result, losing to them became so difficult to digest. Yes, it’s somewhat similar in Pakistan. The idea that India and Pakistan are the Brazil and Argentina of world cricket is a ridiculous one. In terms of passion, undoubtedly, they are. But they are ordinary teams. This colossal sense of our own importance, particularly on the Indian side, is disturbing. You don’t believe Pakistan is hyper-nationalist to the same degree? Since we’re talking cricket, let me give you an example of the subtle differences. When the Indian cricket team came to Pakistan the first time after the resumption of ties, and they won the one-day series, the reaction in Pakistan was a fairly good-natured one. But when the Pak team was winning a match in Kolkata, people were burning the stadium and throwing stuff onto the field. This behaviour comes from hyper-nationalism. The same Pakistani players, if they met Indian cricket fans, would be treated very well, asked for autographs, chatted to for hours. I’ve been in India for some time now and everyone has been so wonderful to me personally. It’s only when people start to think in terms of the group, in terms of India-vs-Pakistan, that their attitude changes. The national dynamic comes in, it manifests itself in this way, and yes, it is different from the way it manifests itself in Pakistan. While there are so many things Pakistan can learn from India – the vibrant democracy, the successful economy and so forth – India could also learn a bit about not being so aggressive in its nationalism; about being a little more humble about individual success; and also being aware of the universal human insecurities that drive this behaviour in the first place. Of course, I’m not suggesting that insecurities of this sort afflict only India. In the Muslim world, broadly speaking, the recourse to militant Islam is being driven by a similar insecurity. The effective emasculation of entire populations has resulted in a hyper-masculine response. Suicide bombing, for instance, is the ultimate response to fearfulness: it's perceived as the ultimate “masculine” response. You’ve talked about being comfortable in your Pakistani skin, but what are the things about modern Pakistan you're uncomfortable with? You’ve written before about your ambivalence towards the Musharraf regime. Yes, I’ve always been ambivalent about them. For a while I thought they were doing some very good things: media liberalisation, a very strong peace overture with India, a very difficult change of foreign policy from sponsoring and supporting the Taliban to moving against them. And in recent years Pakistan has seen an economic growth that was less than India’s but still quite spectacular. However, now we see a desire to cling to power regardless of the political cost, and decidedly undemocratic gestures in terms of undermining the judiciary and moving against the press. What one was able to feel ambivalently positive about in the Musharraf administration was Realpolitik coupled with progressive agenda – but now we’re seeing Realpolitik divorced from progressive agenda. Musharraf could have laid the ground for a democratic transition in Pakistan, but that didn’t happen, and with that one saw the quote-unquote “rise of fundamentalism in Pakistan”. But that’s an idea I’m very sceptical about. You don’t think religious fundamentalism has increased in the last few years? Certainly there is a minority of Pakistanis who are strongly conservative in their religious inclinations, and within that there is a tiny minority that would actually consider using violence as a way of asserting their religious beliefs. But I don’t believe the size of this minority has changed in the last couple of years. There is another minority which is a deeply secular, deeply progressive minority with a lot of economic power. It’s part of the burgeoning middle class in Pakistan – which, by the way, despite the impression many people have in India, is quite large. Importantly, in between these minorities are a huge majority of Pakistanis, who are pragmatic rural farmers. These farmers don’t get much from the state, and they need a pragmatic approach. Being preoccupied with the daily grind of life, with making ends meet for themselves and their families, they are not very susceptible to calls for dramatic and theoretical changes. And this is the ballast that keeps Pakistan relatively centred. In the areas where you don’t have that ballast – in the deserts of Balochistan, in the nomadic and semi-arable terrain near the border of Afghanistan – one finds more extreme behaviour. But these are tiny minorities of the country. And the idea that they are increasing in number and becoming more threatening strikes me as an awfully convenient claim – it provides a pretext for the stifling of the judiciary and for curtailing press freedom and rolling back democratic reforms. I’m not saying there isn’t a threat, but that it’s been greatly overstated. What is the political solution? If we had a more democratically legitimate government we would be able to pursue both a more successful policy of eliminating extremism and also a less subservient policy towards America. What Pakistan really needs is a conversation between all of its parts: between the secular progressive minority, the religious conservative minority and the vast, relatively moderate, pragmatic and quietly religious majority of farmers. And the army, which is a very important constituent and which must be engaged in this conversation. Musharraf could have been well-placed to do this. Imagine a scenario in which he had said “I will step down as chief of army staff but remain as president for one more term.” We would be back to a constitutional form where you could perhaps have an opposition comprised of the more religious-minded parties, a progressive leading party and a president who is no longer in uniform. Such a scenario could deliver the internal dialogue that the Muslim world in general and Pakistan in particular needs, to figure out what it should be doing as a nation. The signs are that we are slipping away from that trajectory. In many parts of the world Islam is seen as a religion that lends itself to being misused and manipulated to suit fundamentalist interests. Your views on this? Also, are you religious yourself? I prefer not to talk about my personal relationship with religion. But when it comes to the perception of Islam, the first thing that occurs to me is this: there are over a billion different Muslims. How do we generalise about a fifth of the world’s population? The very effort to do so says more about us, the generalisers, than it does about those being generalised. Did you know that the number one talk-show host in Pakistan, Begum Nawazish Ali, is a transvestite? Conservative politicians appear on his show, are grilled by him...and even flirt with him. That is part of the complexity, which makes it unfortunate that many perceptions of the Muslim world are so one-sided. What do we call the young kids who are doing Ecstasy at rave parties in Lahore? What do we call the fishermen who don’t even know their prayers? What do we call the guy who is deaf, dumb and mute and has the mental level of a four-year-old? It’s such a diverse group of people These attempted characterisations are problematic and ultimately there’s no usefulness in any of this. You could just as easily define Christianity in terms of the Holocaust experience. What we are really asking is: What is my personal relationship to the Idea of Muslims? It comes from the human need to look for patterns, to label everything. The hopefulness I see in all this is that the civilisations we think are clashing don’t even exist. That’s a reason for optimism. wonderful interview, even though i found that comment about "first love" and the talk about "asian thing" bizarre. this is on my to-read list. will come to it soon. what an amazing conversation. just curious, did this appear in any paper/mag in its entirety? Alok: the idea of the "purity of first love" (and connecting it with a worshipper's love for God) may well have been intrinsic to many Asian cultures. The relationship of the Gopis with Krishna has a similar foundation. Though I appreciated most of what Mohsin said, the idea that "the civilisations we think are clashing don't even exist" is way too optimistic. I'd like very much to believe it myself - but the problem is that if enough people think those civilisations exist, then they do exist. Pankaj: thanks. You should become a reluctant editor and bomb all deadlines. Space Bar: nope. Am chiselling (!) this down to around a thousand words for official publication. When I use the tape-recorder for interviews, I like transcribing the whole thing and putting it up here as a resource of sorts. But looking at this one again it's a pity the whole thing can't be used. Nope, didn't give the wrong impression, but I thought it was funny anyway! 1. " India could also learn a bit about not being so aggressive in its nationalism" :- Hello? have you forgotten the past? Which side was the one who initiated the war 3 times?? "But when the Pak team was winning "a match in Kolkata, people were burning the stadium and throwing stuff onto the field"
How conveneint and easy it is to forget the tantrums the pakistani crowd exhibited when india visited them in 80's and not to forget the Sharjah adventures!!! Writing one book is not going to change the perception of one country nor it is going to change the reality!!! so before Mr Hamid can claim to be in the same league as Rushdies or Seths,,Please try to get the facts right!! Varun: hmm, so you're suggesting India hasn't been aggressively nationalistic in recent times? Incidentally, Hamid made no claims to be "in the same league as Rushdie or Seth". But like them, he's a nuanced enough observer to know that no country (least of all countries as complex as India and Pakistan) can be conveniently defined in terms of one overriding "reality". Much of what he's said in this interview is a response to the simplified perception of Pakistan as a militant, fundamentalist, backward-looking state and India as a benevolent, progressive big brother. The "realities" are never this simple. Accounting for the fact that Hamid sounds like an interviewer's dream - this is still a terrific interview. Even the points I understood were articulated either well enough or differently enough that it was fun to read. Related to that last comment, I do come across enough touchiness around the idea of India(ns) acting like condescending big brothers that it's worth putting on an editorial checklist. I really feel bad when bloggers like you misuse the blogs like this. I don't know why u need to write such a long interview of a fanatic, that too a Pakistani. More over, the interview is meaningless and very boring. God save the country from blogs. I really believe that blogspot should be blogged for ever. You yourself said that "realties are not that simple.." yes i agree they are not as simple as Mr Hamid is trying to portray in this interview by commenting so easily on the Indian Cricket Team or the Indian Nationalism and forgetting so conveniently the antics of his own beloved countrymen in the past? If we were so aggresively nationalistic, then the Kashmir conflict would have been over long time back when we had one of the wars and Nehru chose to goto UN to resolve the dispute. Also, how can you compare the malnutrition rates of Ind-Pak just like that? it has to be based on what percent of the population is malnutritioned and not just the number? Does he have to say anything on what percent of the budget does the Pakistani Govt spend on Defence? If you think India has become aggresivley nationalistic just because we have some Nuclear Warheads then i feel that this Nationalism is the direct consequence of the repeated extremist acts committed on the Indian Soil! Do you really think that India can learn from Pakistan to be more aware of "universal human insecurities"....?? I think we can only learn to make Footballs from them as they are the leaders in this field!!!! I am hindu from Kashmir - but I am not biased. I want to relate a story to you. All my grandparents, uncles, aunts used to live in Srinigar but my parents had moved to Delhi for work. As a child I used to often go to Srinagar for summer vacations. Now here is the tidbit I wanted to share with you. As I played with the local kids in the neighbourhood in Srinagar, they would ask me, innocently, "when I was going back to hindustan". Think about that. The pervasiveness of the alienation with the rest of India that a local resident of Kashmir feels is deep-rooted. From what I could discern, Hamid is a mediocre writer at best, who besides being full of [India/n pertinent] contradictions also comes across a petty and a very, very jealous person. Not to mention, a fundamentalist trying to pass as a Liberal. Varun - besides footballs, they also enjoy a comparative advantage in producing, "ahem", "misunderstood young men", who want nothing more than 72 babes....or was it 72 raisins? i came to your blog folowing the"jabberwock"..it was my favorite poem as a child..and it brought me to a very interesting place you have put together with great effort. the interview was very interesgting..however some of the comments brought me back to the reality of how we are always going to be grounded in conflicts of natioanlism and racism...after all neutrality( of any sort) is a myth..so where do we go from here? if at the dawn of 21 century we still have no space for plurality or multiplicity of views...are we just deluding ourselves? ?..love and frienship and tolerance are a sham..our best hopes of survival lies in living in fear! Jabberwock, what a great interview that. The interviewer and the interviewee sparring at par. Loved the expanse and depth of Mohsin's thoughts. And by that I mean I enjoyed his ideas about the literary novel. The realism versus the magic realism paradigms that he has so well explored. Was glad to know we, Mohsin and I, have some writers we like in common. Also enjoyed his candid, gutsy and passionately dispassionate take on India and Pakistan. We all feed on notions depending on which side of the fence we are in, and what propaganda we want to believe in. I also realized that some of us will never step out of the miasma of hatred that has lost its original relevance but has constantly been fed fresh fodder. Yes, I have deliberately resisted from the traditional hyphenation of these two countries which would only slot my take on this dialogue into a cliché that some of my fellow commentators have already exhibited. I wondered what they were doing at a literary interview? Shouldn't they be at mudslinging Indo-Pak match instead where they could keep company with many such like-minded jingoists? They wanted to spoil the party but they are so out of their literary depths that they leave the actual conversation unaffected. And, before they jump to conclusion I guess I must admit I am an Indian too. By the way you have reviewed my friend and co-writer Shazia Omar's (we belong to a writers' group in Dhaka called the Writers Block) book, "Like a diamond in the sky". Thank you for picking it up and giving it an apt review. More so for turning your attention to writers from Bangladesh, who I believe will also begin to make their presence felt soon, maybe sooner!